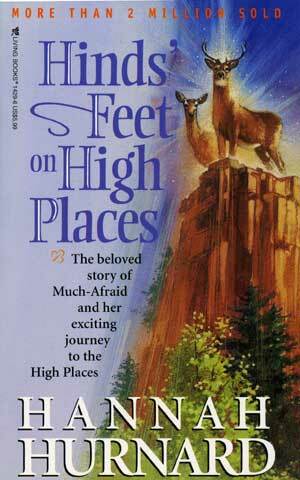 The last time I read Hinds' Feet On High Places was back in 2009 when our family experienced two deaths, back-to-back. We had somewhat expected my father's death from cancer, but not my brother-in-law's death in a car accident. Let's just say that we really didn't like 2009 very much and were not at all sorry to wave goodbye to it. It was a horrid year (and yes, it still burns in our memories). I read this book in the midst of a life that was just dribbling apart. Apparently I was so choked up by the emotions of it that I couldn't even really review it. Sorrow and Suffering were too close at that time and I was definitely gripped with the terror of a climb to the High Places. Fast-forward 7 years and spring has had new life breathed into it. Since 2009 we have added 4 children to our family (Bookworms 2 - 5). Relationships have settled into new places as all family members adjusted to the missing pieces. The pain isn't acute, although I still cry from time to time. I miss my father ferociously. I know he would have thrilled in being Papa to all of these grand kids. This is not even to mention Uncle Landon who we feel certain would have been a crowd favorite. There will always be a void in our lives as a result of losing these close family members, but the intensity and the agony has dissipated over time. In looking back, I can see how God used these two deaths and subsequent life fall outs for our good and for His glory. I cling tighter to His promises and I believe more deeply that He is everything that He says that He is. He is my God, whether life is bliss or filled with horrors. Suffering and Sorrow drug us into places we wouldn't have been able to go ourselves but the Shepherd King was faithful - IS faithful - to work out our salvation. As I read Hinds' Feet On High Places this time, I didn't feel the same sense of desperation as I did before. This time it was a quick re-read, with a few head nods in agreement, but which produced nothing on the level of gut-wrenching. In case you aren't familiar with the premise of the book, it is an allegorical tale describing what it looks like to obey God, even though He might have you walk through hard situations. The story surrounds the character of Much-Afraid who is aptly named. She has met the great Shepherd and longs to follow him up to the high places in the mountains but she is trapped below by fear. She would likely remain in the valley forever if not for the Shepherd calling her to come and follow him To act as her guide to the High Places, she is given two companions by the name of Sorrow and Suffering who will help her along her journey. Reading this book again was an interesting exercise, knowing where I was mentally/emotionally/spiritually during my last visit. While I knew God had a plan in the pains we were experiencing, I didn't much care for anything that was happening. It was horrendous. Hurnard's story captured my emotions and gave me something to focus on to some extent or another. This time, from a place of relative calm (all things considered) I felt the book read off as a little too poetical and dramatic. I had a harder time connecting to the story as a source of spiritual inspiration which it is designed to be. It just didn't meet me where I'm at right now. That said, there were a few passages I marked as being particularly meaningful, having walked through hard things and with the expectation of facing more hard things in the future. Life has its ups and its downs. We're grateful for calm days but we no longer expect them to last. A fellow from our church said something like this to me, "Your theology is good if it accepts the fact that your greatest trial is still to come." Faith in the Lord has to endure in the face of certain trial and tragedy. It's easy to be exasperated when struggles come our way, but exasperation must never lead to defeat. (It also doesn't equate defeat.) One can be weary of struggles but still be ready to face them at the same time. I know that life here on earth isn't meant to be easy; it's meant to change us to become more like Christ. "Disaster" has struck us more than once since 2009 (although never quite so deeply) but there's a knowledge that the Lord will uphold us with His hand. We can't be dropped and lost, although we can be broken and rebuilt. It's part of His good plan. Emotions run deep with the above quoted passages. How often does it happen that we do not understand the way that He is leading? We walk by faith and not by sight for much of the journey, do we not? Step by step we keep following after the Lord, trusting in His goodness and His love. I believe in Him. But I will still crouch at His feet and bawl my eyes out from time to time. This does not mean that I have no faith, but rather that I have faith in a Savior who can handle my emotions and who doesn't look away from me, disgusted by my fears. The Lord has compassion on my family and leads us through the hard places, proving His goodness all the while. Me and my overactive imagination need this reminder frequently. I find that with age I grow less scared of the future full of unknowns. I know that challenges are coming but I'm able to stop myself from imagining them out more often than not and this is a huge praise. The Lord knows me and my imagination and He knows it takes a great deal of self discipline to train it. All I need to know is that God is my God and daily I will seek Him. Daily I will trust Him to lead me, step by step, to the High Places. My job is to follow on, obeying His commands and resting in His promise that He will never leave me or forsake me. Though I will periodically be cast down, I will never be utterly destroyed because I will be upheld by His hand. He is faithful, gracious, and kind. He is tenderhearted and full of mercies which are new every morning. He is my God, and I will praise Him. And I will follow even when it doesn't seem to make sense to do so. But only because He loved me first. The only way to close this post is in song you know. The best way I know how to do that is to invoke a Steven Curtis Chapman into the conversation which might cause you to grin a wry sort of grin. This is my all-time favorite song. I first heard it when I was 16 or 17 (?) and my heart screamed, "YES! THIS!" even then. Twenty years later my heart still screams the same. This book really sounds amazing! I never knew exactly what it was about (until now -- thanks!) but a friend did recommend it me. I actually picked up a copy at the thrift store last year... after seeing your review on it, I'm thinking I should definitely read it sometime soon. It's been years since I read this - it's one of many I probably need to reread at some point.